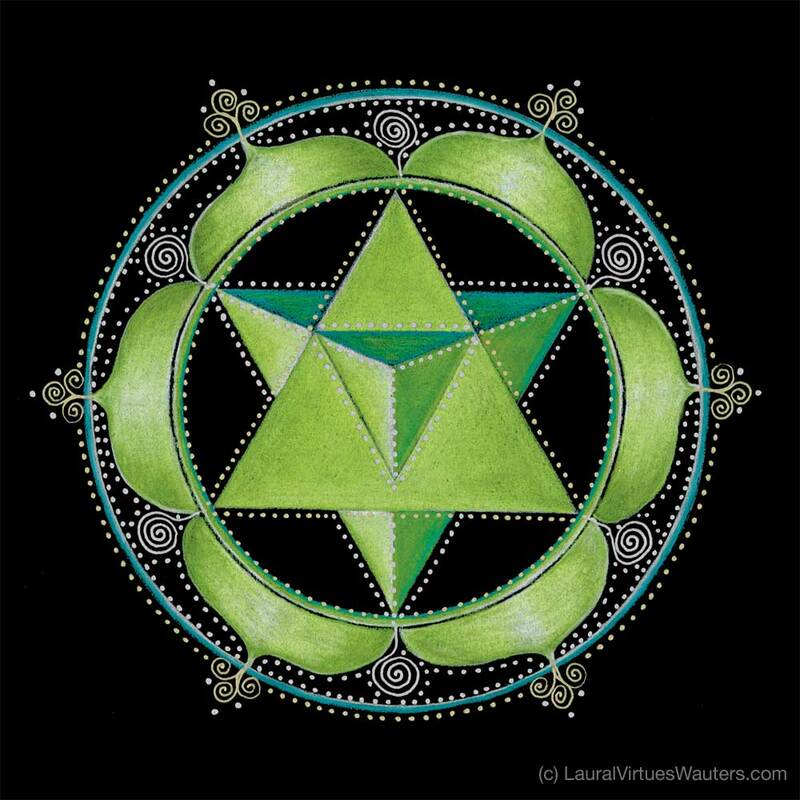 Wisconsin artist, mandala facilitator, shamanic practitioner and educator, Laural Virtues Wauters, created this powerful and stunning Heart Chakra mandala painting using color pencils and gel pens on black paper. Each of the main chakra points in our bodies has a color associated with it. For the Heart Charka it’s the color green. Located in the area of the heart and lungs, the heart chakra represents the center or mid point of the energy body. The lower three chakras and the upper three chakras are anchored in the heart, which is the place of the soul. The two triangles represent the upper and lower chakras. When they intersect they form a Merkaba (mer=light, ka=spirit, and ba=body). The heart chakra holds the essence or core of which we are, anchoring us to the earth’s core and the core of the universe. The heart releases 60% more electromagnetic energy than the brain, it is our soul’s power source, and is fueled by love. View more Laural’s empowering mandalas via her web site: MandalaChakra.com. Be aware of what makes your heart open and what causes it to close. Both are necessary, just like sleeping at night and being awake during the day. Think of your heart as a rose that is filled with the power of unconditional love. The time has come for you to share the miracle of your love.